In a small bowl, combine sugar, cinnamon and flour and mix until well blended. In large bowl, place prepared apples. Add sugar mixture and stir to coat all slices. Heap apple mixture into prepared crust. Cover with top crust, trim and crimp edges to seal. Mix egg white with tsp of water. Using a pastry brush, brush egg white over top crust and immediately sprinkle with sugar. Slit top to vent. Place pie in preheated 450° F oven and bake for 15 minutes. Reduce heat to 350° F and bake an additional 45 minutes, until apples are tender and crust is golden. Remove to cooling rack and cool completely before cutting and serving. Cut decorative shapes from extra crust dough (see photo). Use egg white to paste to top crust before sugaring top (Step 5). 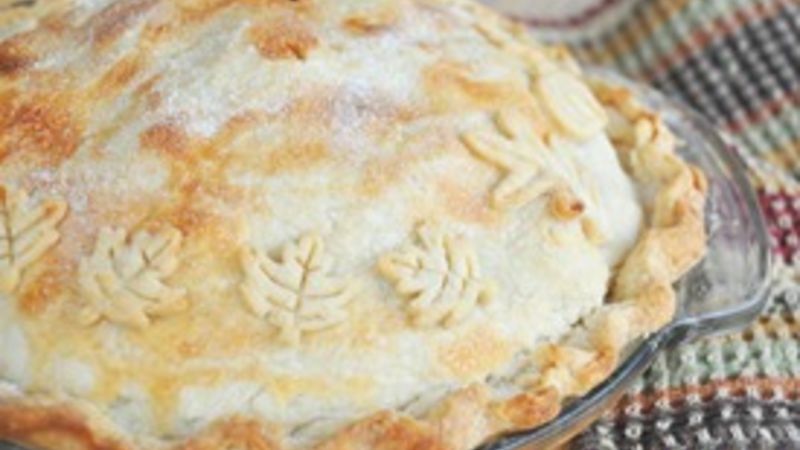 Use only baking apples for apple pie. I like Jonathon, Granny Smith or Macintosh varieties. Eating apples, such as Red Delicious, do not cook down and remain firm after baking. Place foil on the bottom of the oven before preheating. If pie boils over, simply remove the foil and recycle.